Concepts lie at the core of social science theory and methodology. They provide substance to theories; they form the basis of measurement; they influence the selection of cases. Social Science Concepts: A Users Guide explores alternative means of concept construction and their impact on the role of concepts in measurement, case selection, and theories. While there exists a plethora of books on measurement, scaling, and the like, there are virtually no books devoted to the construction and analysis of concepts and their role in the research enterprise. Social Science Concepts: A Users Guide provides detailed and practical advice on the construction and use of social science concepts; a Web site provides classroom exercises. It uses a wide range of examples from political science and sociology such as revolution, welfare state, international disputes and war, and democracy to illustrate the theoretical and practical issues of concept construction and use. It explores the means of constructing complex, multilevel, and multidimensional concepts. In particular, it examines the classic necessary and sufficient condition approach to concept building and contrasts it with the family resemblance approach. The consequences of valid concept construction are explored in both qualitative and quantitative analyses. Social Science Concepts: A Users Guide will prove an indispensable guide for graduate students and scholars in the social sciences. More broadly, it will appeal to scholars in any field who wish to think more carefully about the concepts used to create theories and research designs. 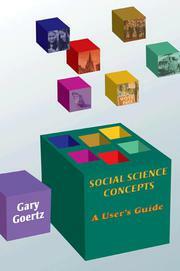 Social Science Concepts: A Users Guide has been written with classroom use in mind. Many of the chapters have been successfully taught at the Annual Training Institute on Qualitative Research Methods which is sponsored by the Consortium on Qualitative Research Methods. Feedback from those experiences has been incorporated into the text. Each chapter provides useful, practical, and detailed advice on how to construct, evaluate, and use concepts. To make the volume more useful, an extensive set of classroom exercises is available from the author's Web page at http://www.u.arizona.edu/~ggoertz/social_science_concepts.html. These include questions about prominent published work on concepts, measures, and case selection; in addition there are logic exercises and questions regarding large-N applications.